President Muhammadu Buhari has assured Nigerians that the Federal Government will not rest until all the Chibok and Dapchi schoolgirls in the Boko Haram custody are released and reunited with their families. 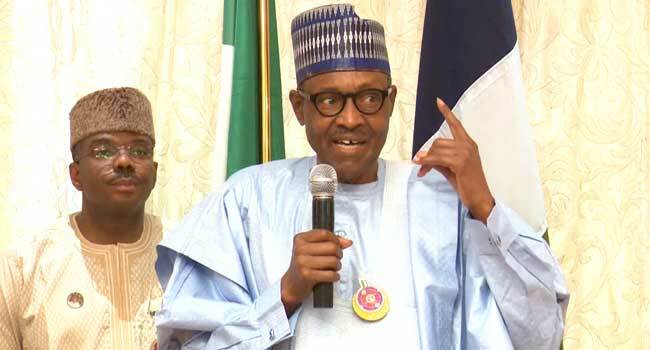 The President said this on Wednesday during a meeting with the Yobe State Governor, Mr Ibrahim Gaidam, as well as the parents of the missing Dapchi schoolgirls at the Government House in Damaturu, the state capital. Also present at the meeting are traditional rulers, community leaders, and top government officials among other stakeholders in Yobe. The Federal Government had confirmed that 110 students were unaccounted for after Boko Haram terrorists invaded the Government Girls Science Technical College (GGSTC), Dapchi, in February. President Buhari, who paid a condolence visit to the state, sympathised with the families of those whose children were abducted by the insurgents. On measures put in place to secure their release, he disclosed that he has ordered the service chiefs to brief him on daily basis on the progress made. The President added that the Federal Government is partnering with some organisations for the safe return of the girls, recalling that more than 100 Chibok girls have so far been released. He noted that security has improved at the mosques and churches attacked by the terrorists in most Northern states, following the degrading of the terrorists. On his part, Governor Gaidam thanked the President for sharing their grief and described his presence in Yobe as a fatherly visit. He assured him that the people of the state are behind him and that they would do all necessary to support the development of the country. The governor noted that President Buhari has done well by embarking on the visit, having sent four separate delegations to Yobe. According to him, the visit has given the state government and the people the confidence need that the abducted schoolgirl would return soon. Governor Gaidam also thanked the international community for their concern and the security agencies for their unrelenting effort in the fight against the insurgency. He informed the President that the military has restored personnel to Dapchi town while security personnel have been deployed in all schools in the state.